These maps provide a window into Auckland night life across the decades. At the early dance halls, the rules for dancing with a partner were regimented and the musicians’ primary purpose was to provide standard tunes at a strict tempo for those out on the floor. The modern style of venue often has the performer as the focus and the songs are just as likely to be originals as cover versions of overseas songs. For each venue, we’ve endeavoured to provide an image and a “Read More” link to provide further reading on either the venue or one of the musicians who was associated with it. Click on the thumbnail image and a full screen version will open in another window. As you can imagine, it has been quite a task to compile this information, so we'd be glad to receive feedback from readers. The rock’n’roll dance halls and restaurant-cabaret scene became more widespread in this decade. They were joined by coffee lounges that would act as cafes during the day and then open for music at night – examples being the Picasso (roughly where Aotea Square is now), Montmartre on Lorne Street and the Bel Air across from the Auckland Town Hall. 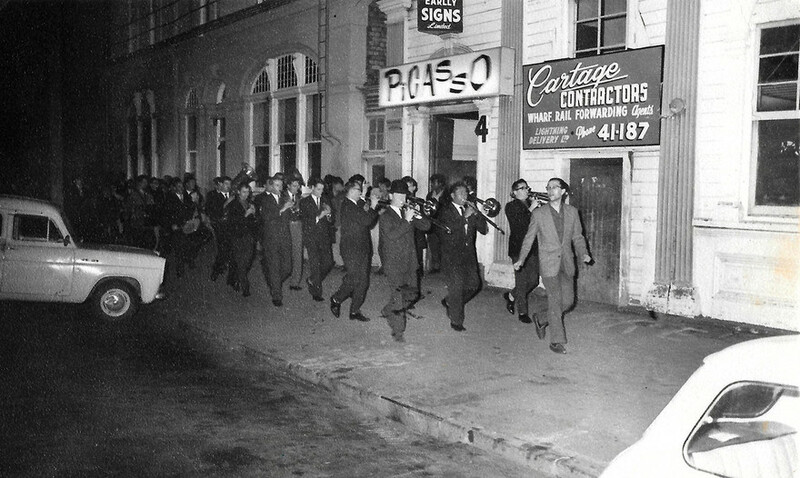 Led by “drum major”, bassist Les Still, the Auckland Jazz Club band escorts the Kenny Ball Band past the Picasso on Grey's Avenue, Auckland, to the Monaco on Federal Street, 1962. The influence of promoter Phil Warren was inescapable during this decade – opening up the Oriental Hall on upper Symonds Street as a dancehall, then starting clubs like Monaco and Mojos, and even creating a joint exclusively based on the music of the Fab Four – The Beatle Inn in Little Queen Street at the bottom of town. 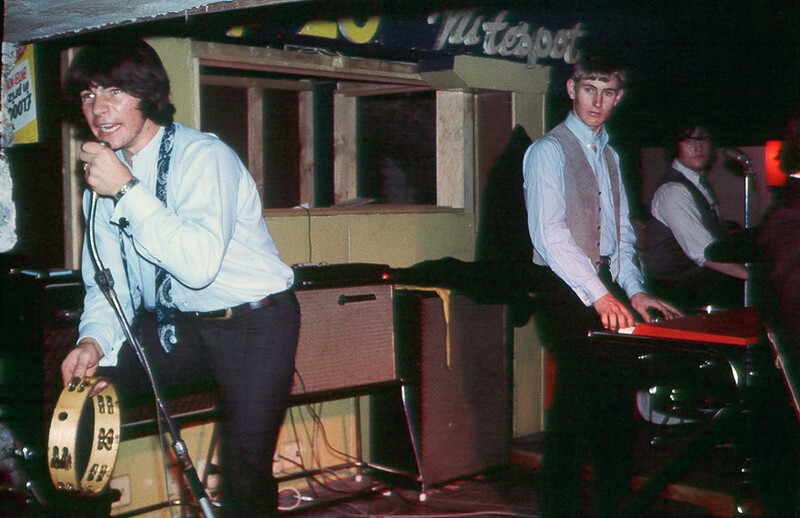 Jamming at the Monaco Club, Auckland, 1962. From left: Merv Thomas, John Bennett of the Kenny Ball Band, Neil McGough and Don Bruce. Many of the night spots were known for their resident band, such as the Top 20 on Durham Lane where Larry’s Rebels played all the top songs from that week’s hit parade – or around the corner at Platterack where hot young act The La De Da’s was in residence. Larry's Rebels at the Top 20. - Kurt Shanks collection. 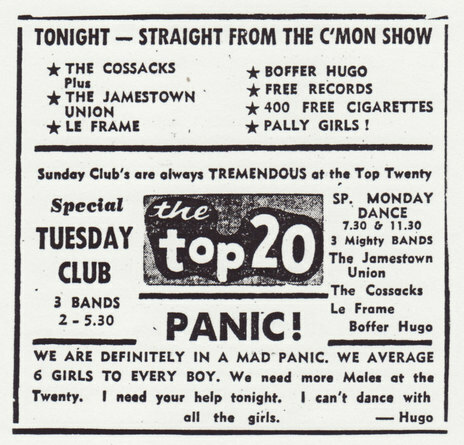 An advert for the Top 20 Club in 1967. The compere, Hugo, was Hugh Lynn, who also ran the security. It was such a busy time for live music that it’s hard to capture the whole scene. Halls across the city were being hired out for weekly dances but pinpointing the location of some of them, let alone finding information on who played there, proved elusive in some cases. Even with a few spots missing, the map below shows a city packed with places to see live bands. Note: the map is best viewed in full screen mode, especially on mobile phones. Click on each venue’s thumbnail image and a full screen version will open in another window. Thanks to the Auckland Library Heritage Trust for its support with this project.